Calculating PURAIN Rainwater Pre-Filter Capture Efficiency. Posted on June 5, 2018 at 1:20 pm. In another post we showed how to size a PURAIN self cleaning Jump Filter. In this post we show that once you have selected a filter, how to estimate the expected capture efficiency. Look up the 5 minute intensity, 1 year interval rainfall for your installation site on the NOAA website. Using this number to calculate flow off the roof. Compare this flow to the maximum allowable flow for each filter and choose the smallest filter that will handle this flow. Download this handy sizing chart! It shows recommended sizing for a wide number of US cities using the method above. The message is that it is not possible to give a blanket square footage rating for a filter because rainfall intensity varies so widely throughout the US and throughout the world. Many other filter manufacturers erroneously give roof square footage ratings based on intensity rainfall rates in Germany! There are places in the US and elsewhere in which these guidelines work, but there are many more that do not. 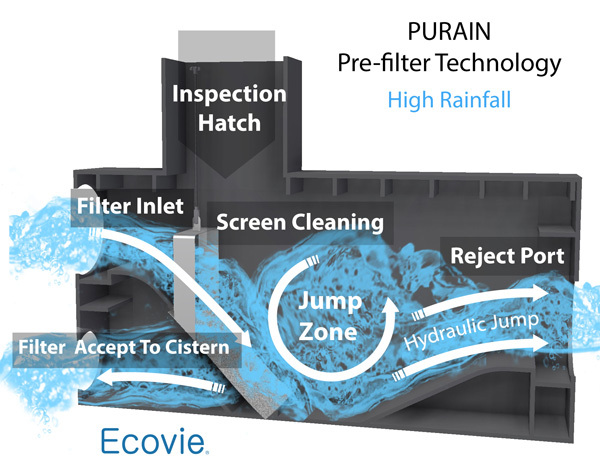 Once you have selected a PURAIN filter, you can estimate how much water it will collect. To do this, I take a 9,000 square foot small commercial roof and place it in 3 separate locations, Boston, Miami, and San Francisco. There you have it, different filter sizes are recommended in different locations even though the roof sizes are exactly the same. It tends to rain harder in Miami than in Boston and harder in Boston than in San Francisco. This means you need a different sized filter for each location. So, how does each filter perform? Capture efficiency is very good for all 3 locations. There are a decent number of hydraulic jumps for all locations. Miami, especially, has a lot of filter cleaning with 24 hydraulic jump events. More water is captured in Boston than in Miami even though it rained less there. This is due to the high intensity rains in Miami. Indeed, around 75% of the rain in Boston in 2014 was at a rainfall rate of 0.5″ per hour or less versus only 28% for Miami. What if smaller filters were used in Boston and San Francisco? Not much capturee efficiency is lost in Boston, so downsizing may be OK. However, overall hydraulic load on the filter will be exceeded more frequently so an emergency bypass would be required. In Miami, the bigger filtercaptures a little more water but the number of hydraulic jumps decreases a lot so the filter may not stay as clean. The added cost of the bigger filter may not be warranted. The approach of using 1 year, 5 minute interval data as a sizing guide works well for the cities investigated. we have found this approach to work well in many other geographies as well. Capture efficiency is good for the filters selected using this method and trying other sizes probably would give worse results.